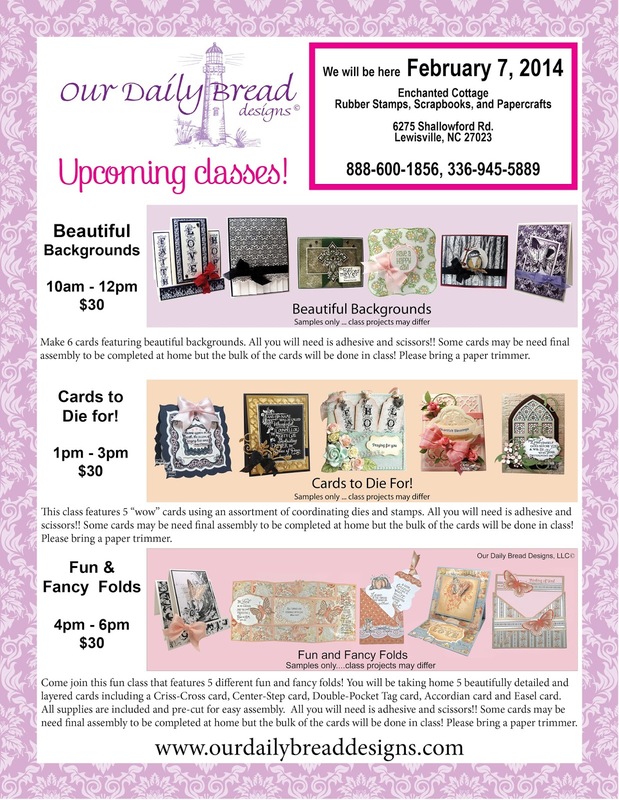 We are excited to let you know that we will be at Enchanted Cottage Rubber Stamps, Scrapbooks, and Papercrafts in Lewisville, NC for Classes and Shopping on Friday, February 7, 2014 and Saturday, February 8, 2014. To register for classes, please call the store to reserve your spot! Please see the flyer below for class descriptions. Even if you cannot attend classes, come and check out Enchanted Cottage Rubber Stamps, Scrapbooks & Papercrafts and Our Daily Bread Designs, we will be having a mini stamp show, as we our bringing our 30' trailer full of our ENTIRE inventory...that's over 500 stamp sets and dies!!! !